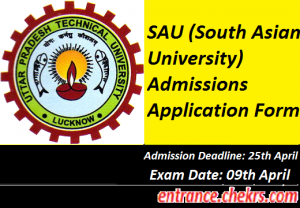 SAU (South Asian University) Admission Form (एसएयू आवेदन पत्र) 2017: South Asian University has opened its admissions for the session 2017-18. South Asian University is offering admissions in various Master’s and Ph.D. level programs. The last date for the submission of the South Asian University 2017 Application Form is 25th March 2017. The SAU 2017 Admission Test will be conducted on 9th April 2017. The SAU gives admissions to both SAARC and Non-SAARC students. The Non-SAARC students are advised to submit their SAU Admission Form 2017 in the south Asian university Delhi on or before 25th March 2017. South Asian University is a very reputed university. It is established by the countries which are the member of south Asian Association for Regional Co-operation (SAARC). SAU attracts the applicants from all the SAARC countries. It is located in the Chanakyapuri region of New Delhi, India. South Asian University offers various courses for the students for both Master’s and Ph.D. programs in Economics, Computer Science, Biotechnology, Applied Mathematics, Sociology, International Relations, and Legal studies. Aspirants passed/appearing graduation can apply for the Master’s programs in the south Asian university. Aspirants who have completed their 1st year of M.A/M.Sc. can also apply for the lateral entry. They will get admissions only if their qualification meets the eligibility criteria. Aspirants who will get admissions in master’s program shall not be allowed to do any part time job and full time job. Aspirants appearing/passed their Masters can apply for the PH.D. Programmes in South Asian University. If the results for the appearing students will not be declared by 31st July 2017 they will not be allowed to claim their seats in the university. Aspirants will be selected on the basis of both interview and entrance test marks. South Asian University has announced its admissions for Masters and Ph.D. programs. The entrance exam will be conducted on 09th April 2017. Aspirants are required to submit their SAU 2017 Registration form by 26th March 2017. There are some step given below for the filling and submission of the SAU registration Form. Aspirants have to access the official web portal of the university i.e. Now open the apply online link given in the notification panel. Fill all the required detail carefully and correctly in the application form. Now attach a scanned copy of colour photograph and a signature in the given valid size. Aspirants have to pay the application fee via online banking/net banking/credit card/debit card etc. For the submission of the application form click on the submit button. Take a print out of the application form for examination purpose. The application fee for the SAU application form is Rs.650 and to be paid only by net banking or via online modes of payment. If the aspirants are unable to pay the fee online they can send the demand draft in favour of ‘South Asian University’ payable at New Delhi. And the DD will be posted to the Deputy Registrar Admissions, South Asian University, Akbar Bhawan, Chanakyapuri, New Delhi-110021(India). Admit Card for South Asian University entrance exam 2017 will release in a week before the examination. Applicants download their South Asian University Admissions 2017 Admit Card from the official website of the university. Aspirants have to type their name and registration number to download their admit card. Without admit card no student will be allowed to enter the examination centre. Aspirants also have to bring their photo identity with their admit card on the day of examination for proof. The admission in the south Asian University for PG and Pprogramsammes are open now. Aspirants who are willing to take admission in South Asian University can apply for the South Asian University 2017 Application Form on their official web portal. The students from all the SAARC countries can apply for the examination. The last date for the submission of the registration form is 26th March 2017. Exam will conducts on 09th April 2017.The selection of the students will be done on the basis of entrance test scorecard and the marks obtained by the candidate in the interview. For more queries regarding the SAU 2017 Application Form, you can contact us by commenting in the comment section given below.